Back in early December 2011, we found ourselves driving between Cork and Waterford. As we passed by Youghal, I saw roadsigns for Lismore, reminding me that I was yet to visit O'Brien Chop House (which has been open since 2009). Being a creature who demands immediate satisfaction in matters of food, we quickly decided that lunch in Lismore would be a very fine idea indeed. Lismore is a beautiful town, sitting on the Blackwater river at the foot of the Knockmealdown mountains. Old shopfronts have been preserved and the entire town just breathes history and tradition. O'Brien Chop House is itself located on the premises of an old Victorian pub. As you push open the narrow wooden door, and walk across the tiled entrance, you will find yourself in a piece of old traditional Ireland. The original bar, shelving and snug have all been maintained, while the dining room extends out to the rear. After ordering, we received selection of freshly baked breads served with a pat of Glenilen Farm butter. 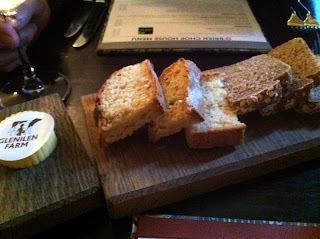 The breads were excellent, and it's really nice to see farmhouse butter starting to appear in different restaurants. The menu at O'Brien's regularly features a fizz and on our visit, spiced apple fizz was a nod to the season (€3.50). Elderflower fizz also features frequently, thanks to abundant crops which need to be used and frozen. 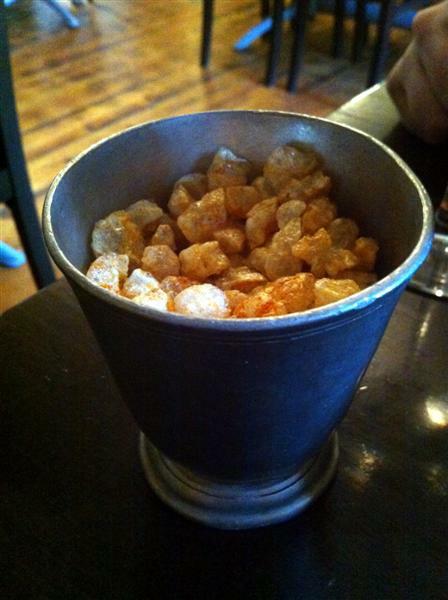 We ordered a portion of pork crackling popcorn as a snack while waiting for our mains. Little puffs of crackling came served in an old, battered pewter cup lightly dusted with paprika and sea salt (€2.50). To be honest, we found them somewhat compulsive eating. We shared one of the daily special starters - Dry aged McGrath's beef steak tartare (€12.50). This was served with a stunning yellow duck egg yolk sitting on top. 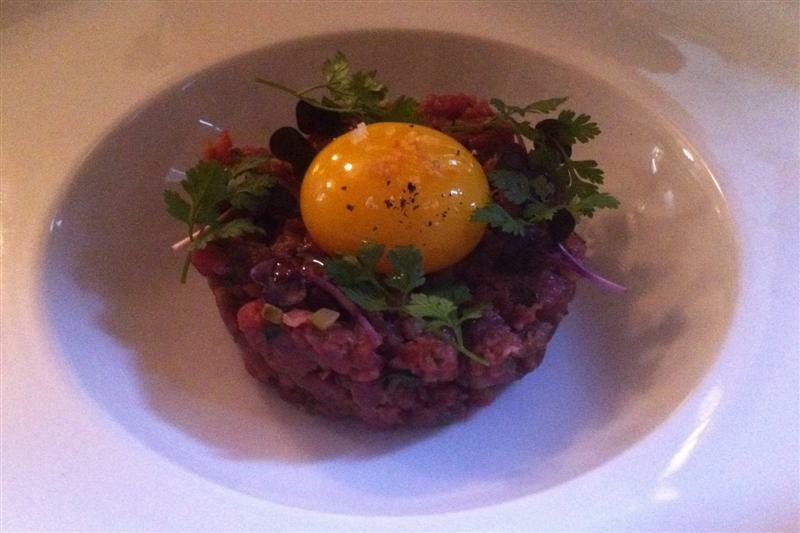 Once the yolk was broken and mixed through the meat, we was found the tartare to be wonderfully flavoursome with a smooth, dense texture. Delicious stuff. 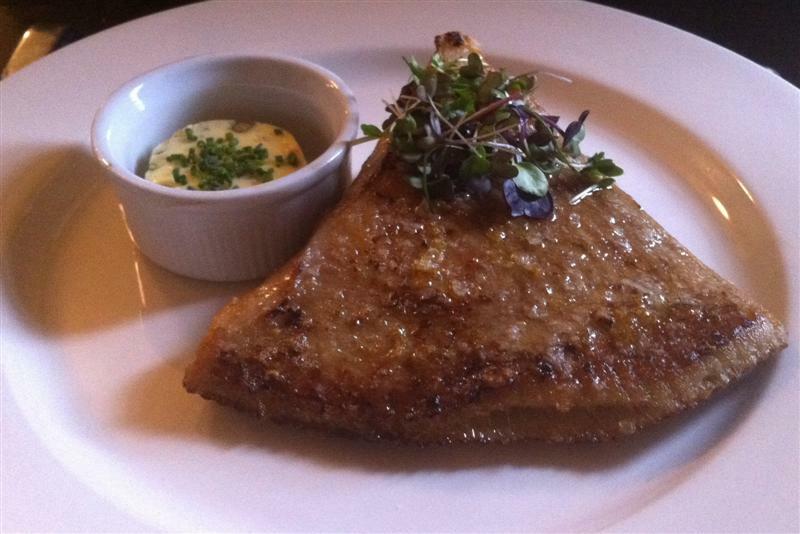 My main course was Ballyvolane House Saddleback pork chops, apple and onion jam with pan juices (€21.50), while he chose another special, pan-fried ray wing with lemon and caper butter (€19.90). Wonderful roast winter root vegetables and a portion of fries accompanied our mains. The ray wing was a simple piece of cooking with plenty of firm, meaty flesh and it caused us both to wonder why ray wing isn't featured more frequently on restaurant menus. The pork chops were substantial, with the pink hue that comes with really good pork. Despite all this, the roast root vegetables were the stars of the show. Piled high in a blue & white china bowl, they were warming and hearty with all the goodness of the roasting pan. 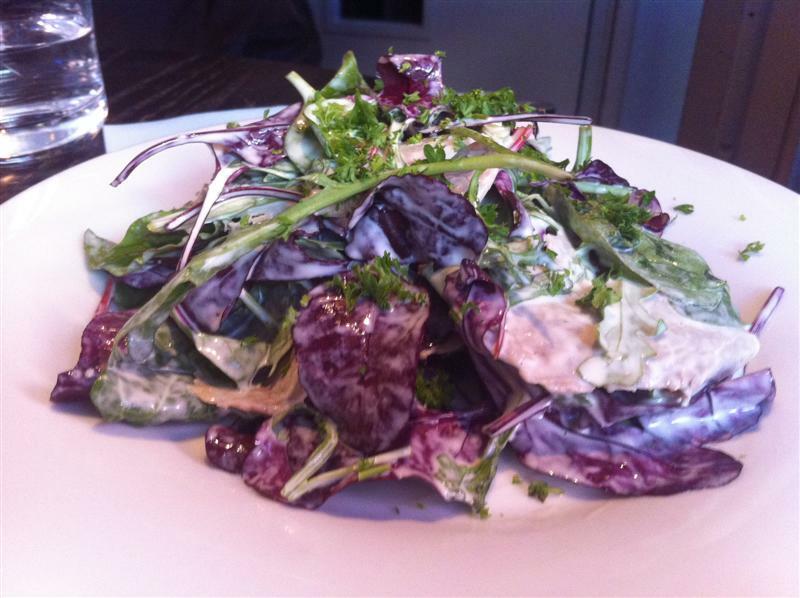 O'Brien Chop House sources local, seasonal produce, with an in-house garden kitchen. On the day we visited, the menu featured a special of whole, roast mallard, and I gained much amusement watching a fellow diner wield a knife to the whole duck. Although the duck may have lost the battle to the gamekeeper, it was definitely managing to defeat my neighbour. As we left through the old bar, I imagined myself back again, only this time in the evening, and with a local beer in hand. O'Brien Chop House draws you back, it's that kind of place. I've written recently about Heineken's efforts to promote the pairing of food and beer. 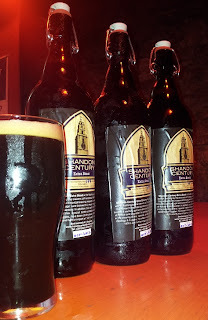 As part of this initiative, I was invited to a session in the Siam Thai Dundrum, where we learned a huge amount about beer from a master beer sommelier, as well as seeing how beer works with different foods. Heinken Ireland continue to promote the matching of food and beer and have recently launched a new webiste thisisbeer.ie. Described as a "beer hub built to celebrate the natural goodness of beer", the website is intended to act as a venue where experienced and novice beer drinkers can discuss and learn about beer.The website will provide details on the different Heineken brands, as well as providing recipes to showcase how beer can pair with food. Sometimes, it's easy to forget that beer is a wholly natural product, made from just four ingredients: water, barley, hops and yeast. As a natural product, beer is a perfect accompaniment to food and with a wide array of brands on offer from Heineken Ireland (including Tiger, Zwyiec and Paulaner), there surely is a beer out there for everybody. Everyone needs a surefire recipe for the Christmas season. It has to be easy, quick but still produce a result that is delicious and suitable for this period of indulgence. 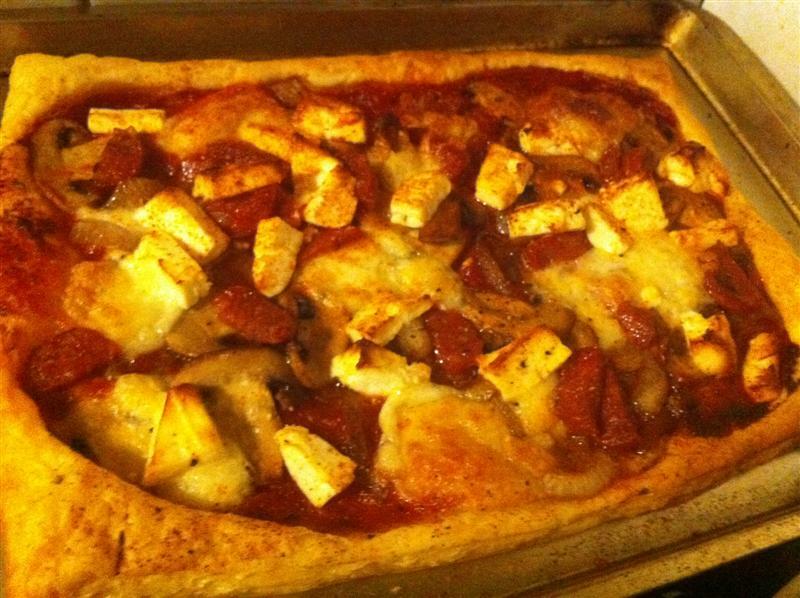 So here's my suggestion of puff pastry pizzas. The beauty of these pizzas, or tarts, is the ease and speed with which they can be made. But once that buttery, flaky pastry comes out of the oven, there is a feeling of luxury and specialness. Perfect for Christmas. I think ready made puff pastry has to be one of life's greatest inventions. Making puff pastry from scratch is no mean feat (usually reserved for Masterchef competitors), so why bother at home when you can purchase it chilled and ready to go? The commonly available option is Jus-Rol frozen pastry, but I've never fully liked it. However, I recently tried Tesco's Finest chilled puff pastry and really liked the results. It also has a shelf life of several weeks, which means that you can keep it in stock for ad-hoc cooking. First of all, you'll need a tomato sauce for the base. I love my own recipe for pizza sauce but you can use whatever you have to hand. Preheat the oven to 180C, get the chilled puff pastry, cut into four equal pieces and place onto some baking sheets. Place some tomato sauce onto the middle of each sheet and spread out, making sure to leave bare strips on the sides. 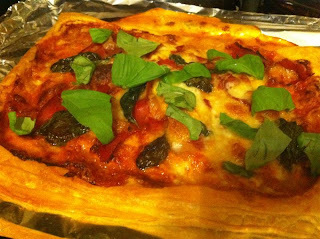 Doing this means that pastry will puff up at the edges, providing a lovely flaky crust to your pizza. Top the tomato sauce with some shredded or grated mozzarella. Finally, add your toppings. Recent favourite combinations of mine have included parma ham and fresh shredded basil as well feta cheese, chorizo and carmelised red onion with a light dusting of chili flakes. Place the pizzas in the oven for about 15 minutes, or until the edges are puffed up and golden. Once out of the oven, leave the pizzas to sit for a few minutes to give the cheese time to set a little before eating. To add some extra flavour and aroma, scatter some fresh basil on the parma & basil pizza. Cut the pizzas into smaller portions and serve. Just make sure to catch all the delicious buttery flakes! I spent two whirlwind days in New York in November. I was scheduled to travel to North Carolina for work purposes, and we decided to wedge in two vacation days and make a pitstop in the city that never sleeps. I only got the green light for the business trip one week beforehand, so all our personal arrangements were made in a flurried hurry. As a result of all this rush, we didn't work out an eating plan in advance. 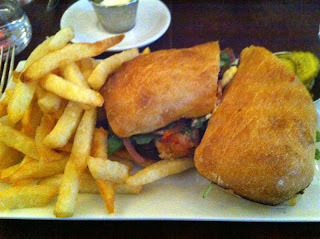 But we did promise ourselves that we would try to hit one really good restaurant, ideally for that New York institution, brunch. For a change of scenery we stayed in Brooklyn, as opposed to Manhattan. This turned out to be a real brainwave and we got to see some new and upcoming areas in Brooklyn. Dressler is a Michelin-starred restaurant on Broadway (not THAT Broadway, but the Broadway in Brooklyn). It's very handsome inside, with old tiled floors, iron chandeliers and backlit metal grilles. The dominant colours are dark red and black with soft lighting. It all adds up to a feeling of aged sophistication. The brunch menu is a nice mix of light fare, egg-based dishes and more substantial sandwiches and burgers. The menu is rounded off with oysters and a nice selection of brunch cocktails to help on those hairy mornings. 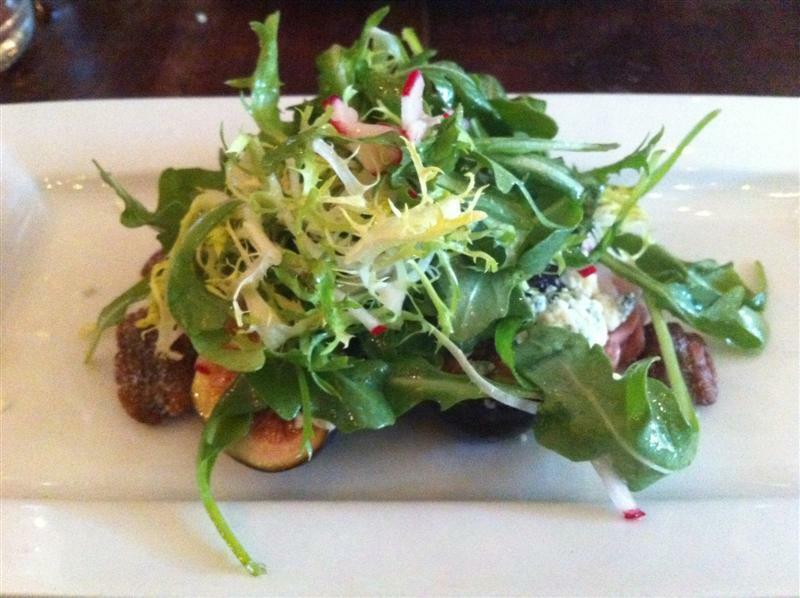 We both started off with salads, a fig, prosciutto and blue cheese salad ($12.00) for me, while he enjoyed a smoked trout and apple salad ($12.00). Both dishes were light with a good balance of flavours from the different combinations. 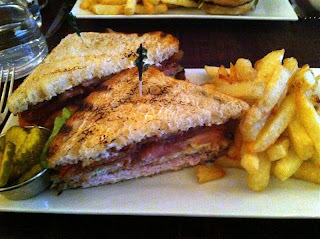 For main courses, he chose a turkey club sandwich ($15.00) while I chose a pork BLT ($16.00), both of which came served with fries. A little bowl of pickles completed the plates. As it was Sunday, and I was on holidays, I also chose a La Batida cocktail ($12.00) to enjoy with my brunch. I ordered the cocktail just a little before midday, which meant that I had to wait for the clock to tick over before the barman could make and serve it to me. La Batida is a Brazilian coconut-based cocktail which features fruit mixed with cachaça. It was creamy and gently sweet, with the bite of alcohol. Very tasty indeed. Our meal was Sunday brunch food at its best, satisyfing and tasty. Dressler really seems to exemplify modern American cooking. The relaxing and unique dining room is just lovely, and service, as you'd expect, was attentive. Two good americanos meant that our total bill came to approximately $90. By any standards, that's a lot of money for brunch, but Dressler was worth the trip. A few weeks ago, I received an invitation to attend a beer and food matching evening, courtesy of Heineken. Several different sessions were taking place in Cork and Dublin and I put my name down for the dinner at Siam Thai in Dundrum Town Centre. I was curious to see what Heineken would offer at this event, and how they could make their big name brands stand out. 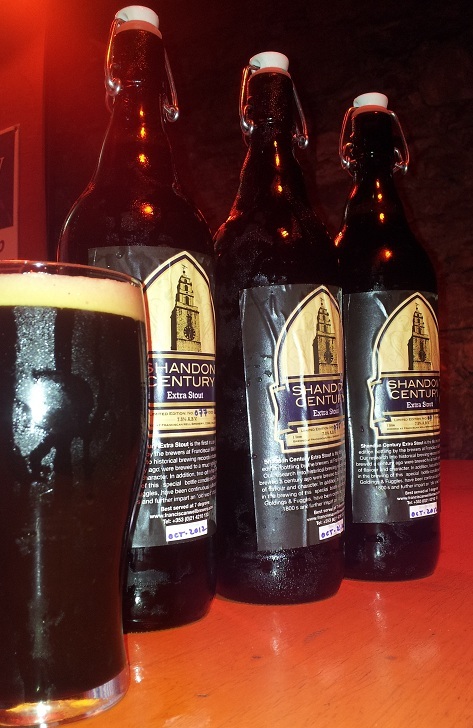 It's possible to argue that they are Goliath, striding into the growing Irish craft beer movement, potentially at the expense of the smaller breweries. However, I have to say that I enjoyed the event immensely and found it very educational. The knowledgeable Fiona Smith from the F&B Partnership was our tutor for the evening, and she gradually took us through the different ways of experiencing and tasting beer. A special menu had been selected for us at the Siam Thai. We were to have a mixed starter plate with each starter being paired to a particular beer. This would be followed by our choice of main course, again with a suggested beer pairing. All tables were set with a selection of large wine glasses, which were used for tasting the various beers. Fiona kicked off by informing us that beer had the same basic properties as wine, particularly when it came to pairing with food. In fact, beer actually has a broader spectrum of flavours than wine and comes in different colours including dark, amber and white (naturally cloudy or unfiltered beers). The quick guide to tasting beer..
We moved onto our first beer, Paulaner, which was paired with chicken & pineapple skewers. We poured the beer into the wine glasses, swirled and sniffed as instructed, revealing tropical fruit smells. Paulaner is a Hefe-Weissbier from Bavaria, but I really pleasantly surprised to find lots of banana flavour in the beer, something I'd never noticed before. The last of our starters, spicy Laab gai salad, was paired with the Malaysian Tiger beer, which has been brewed since 1932. Author Anthony Burgess even named a novel "Time for a Tiger" after the famous advertising slogan "It's time for a Tiger". This was hoppier than the previous beers, but it's light and fresh flavours meant that it balanced the spicy chicken salad quite well. Suggestions had been given for our main course pairings, but I declined the suggestion for my main course choice of lamb with Thai herbs, and instead chose another bottle of Zywiec. 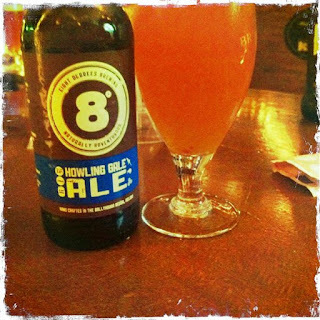 This beer had been my clear favourite of the 3 tasted so far and I wanted to enjoy it some more. Himself chose Moretti to accompany his red curry prawn noodles. As we were eating and slurping beer, Fiona was doing some rounds of the tables, answering any additional questions that we may have. The big lesson of the night was to serve beer in glasses that are wide enough to give you a chance to really smell the beer. I had been surprised to see big red wine glasses on the table, but they were the perfect vessels for the beers. 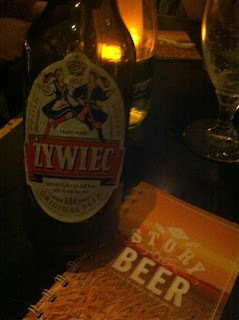 Some of my previous thoughts about beers were overturned on the evening. Prior to this event, I would never have ordered a Paulaner of Zywiec, but this tasting event really opened my eyes (and nose) to their fruity aromas and flavours. A big thank you to Fiona and the crew from Heineken and Thinkhouse for organising this great event. For more information on the Heineken family of beers, events, and suggested food pairings, visit www.thisisbeer.ie. I've been so busy with work lately that I only realised my birthday was imminent a few days before the event itself. To celebrate my 33rd year, Himself booked dinner at Locks Brasserie, located in a little terrace on the banks of the Grand Canal. I was delighted with the choice as the restaurant always looks so captivatingly lovely at nighttime, with light spilling out over the canal and swans sailing serenely past. Memories of Patrick Kavanagh and "stilly, greeny" canal water come flooding back. After arriving, we sat at a small table in the bar area to enjoy some aperitifs and read the menu. Perhaps it was due to the canalside location, but I thought there was a slight smell of damp in the air. We were going to order something fizzy, but then we saw the barman making martinis for some other customers. Shortly after, we found ourselves sipping on two excellent gin martinis with a twist. Martinis ooze adult sophistication and these babies definitely oozed gin. In 2002, Roger Agnell wrote a wonderful essay about Martinis for the New Yorker magazine - definitely worth reading if you have any interest in this wonderful cocktail. After a few minutes, we sailed on a cloud of oily gin to our table. Our lovely waiter gave us plenty of time to make our selections, which in turn gave us time to look out from the warmth to the cold night outside. The downstairs dining is simply decorated in cream wood panelling, letting the charm of the old building shine through. It is, in short, a very comfortable and welcoming space. My starter of a single large langoustine and lobster ravioli came served on spinach, with the waiter pouring a lobster bisque at the table. At €15.50 this was a pricy starter and it just didn't work for me. The ravioli was lovely with sweet meaty flavours but I just didn't like the bisque, which seemed to have a slightly burnt, over-carmelised tone. His chosen starter of celery veloute (€7.00) was deemed to be quite nice, with a sweet creamy flavour (I can't abide celery, which means that it's banned at home, so he grabbed the opportunity to enjoy). The lobster bisque hadn't suited me and things didn't get any better with the arrival of our mains. He had chosen the wild mallard, served with pumpkin gnocchi, savoy cabbage and blackberry vinaigrette (€26.00), while I had opted for the dry-aged rib-eye steak, served with bone marrow, french fries and Bearnaise sauce (€28.50). The major fault with these dishes was the disparity in size - the steak was large enough to feed a caveman, while he received a few meagre slices of what must have been a rather skinny duck. It really amazes me that a chef saw these dishes at the pass and never paused to question the asymmetry. When ordering, himself had inquired if he would need to order a side dish. Our server had been quick to assure him that the duck would be plenty large, so the resulting small size was doubly galling, and to add insult to injury, the duck was dry. We ordered an extra portion of fries to provide some bulk, but like the duck, the portion sizes were on the small side. I should mention that my steak was cooked excellently, and I really did like the small piece of accompanying marrowbone. But there was no escaping from the fact that the size of my dish meant that I was eating long after he had cleared his plate. The imbalance was striking. 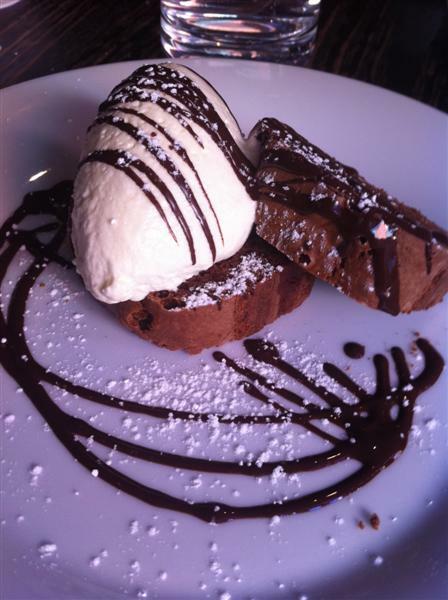 On the flip side, desserts were excellent. I ordered an iced whiskey and honey parfait with wonderful homemade honeycomb and tiny little pearls of mulled pears (€10.00) and while he had crème brûlée made with free-range eggs (€6.00). We did have a very nice time in Locks. 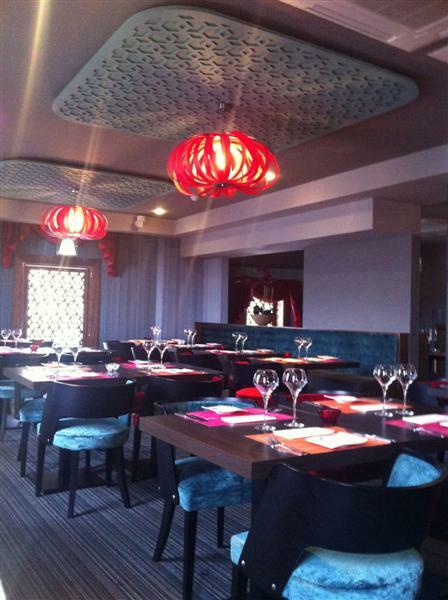 Service was wonderful throughout and the dining room has a lovely atmosphere at night. But the disjointed food left us feeling disappointed with the meal and we just didn't feel that we got value for money. At this end of the money scale, a customer should expect all aspects of a meal to deliver. 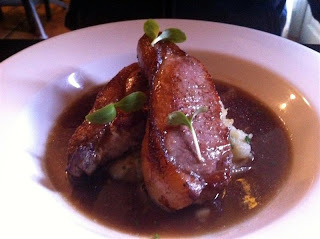 Lock's does offer a value menu, which features a limited range of courses from the a la carte menu, so I suspect that I might be back to try again, but at a better price. Locks Brasserie, 1 Windsor Terrace, Portobello, Dublin 8. About a month ago, an invitation was issued to members of the Irish Food Bloggers assocation to enjoy a tour of the Bramley apple orchards, located at St. Margaret's, Dublin (courtesy of Keelings). The mere suggestion of Bramley cooking apples sucked me into a time vortex (thankfully sans swirly lights and music) back to my childhood and to the time when I received my first introduction to cooking. My educator was my maternal grandmother, known to me as Ma. She lived about 2 miles from us, on her own in a farmhouse that had never really been modernised. Her sole cooking devices were an open fireplace and an old enamelled gas cooker, which lurked in the back kitchen, clearly playing second fiddle to the fireplace. When it came to cooking meat and two veg, Ma definitely came from the old-school style of cooking. This could also be more accurately described as the "lash it all into the one pot and boil until grey" style of cooking. I used to be entranced by the fact that she would boil whole onions, which would be served translucent on the plate alongside the poatoes and meat du jour. My fascination however, never extended to actually eating one. Ma was a serial visiter of funerals and upon receipt of the daily edition of The Cork Examiner, she'd turn straightaway to the Deaths section and mark out her travel itinerary for the next few days. She would then use her pensioners' allowance from Telecom Eireann to deliver the driving orders to my mother. Once I gained my first provisional licence, she quickly realised that she now had two drivers at her disposal. And thus it was that I spent many days driving up narrow winding country backroads in West Cork and Kerry, delivering my grandmother to removals, rosaries and wakes. One of the major (but mainly useless) benefits of this was an in-depth knowledge of church and funeral home locations. I also developed an unnatural ability to predict when I would next encounter a single sheep in the middle of the road. Sheep detection skills aside, the key benefit of accompanying my death-obsessed grandmother was the fine food presented in the parlours and front rooms. Victoria sponges with fresh cream and home-made jam, snowy white with icing sugar. Fresh warm scones, served with more lashings of the same home-made jam. (I should point out that the foodie word "preserves" would have never been uttered, it was always simply "jam"). And there was always an apple tart. A home-made tart, in the shallow country-style, with golden encrusted seams where the juices had escaped during baking. I was convinced that my Ma made the finest tart of them all. She would never have held with the modern styles of deep dishes or the addition of cinnamon or other spices. She knew just one way to make an apple tart, but by God, it was a good way. First out would be the mixing bowl with flour, measured by china cup, along with butter, egg & milk. Pastry made, it was used to line the enamel dish, into which she would then layer sliced "cookers", or Bramley apples, a sprinkle of sugar and then the pastry lid. A quick coating of milk and into the oven. Her pastry never rose, and her style was quick and rough, but some magical alchemy happened in that oven. What emerged was heavenly, a transubstantiation, if you will, of the coarse, tart Bramleys into a sweet, fragrant dish. The shallow old-fashioned apple tart, made with Bramleys will forever remind me of my grandmother. There is nothing else that transports me so quickly back to her kitchen, with its open turf fire and wooden settle. I still sometimes make this style of apple tart when I'm at my parents' house, and best of all, my mother still has the old enamel dish my grandmother used to use. Some things just can't be beaten. Written in loving memory of Margaret Scriven. When in Cork, I pretty much always stay at the Gresham Metropole. It's has free wi-fi throughout, clean white bed linen and is very centrally located. Best of all, prices can be quite keen and I love the old style and corridors. As far as I'm concerned, it's a far better offering than some of the newer, more expensive hotels in the city. Ever since I've moved to Dublin, I've missed Cork chips. Dublin chips are good, but they're a different style and sometimes only chips from Lennox's or Bartie's will fill the void. The fact that the Fish Wife chip shop is located just across the road from the Metropole is just another plus for this hotel. The Fish Wife is a relatively new addition to the Cork chipper scene, but it manages to bring a modern twist to this traditional food style. 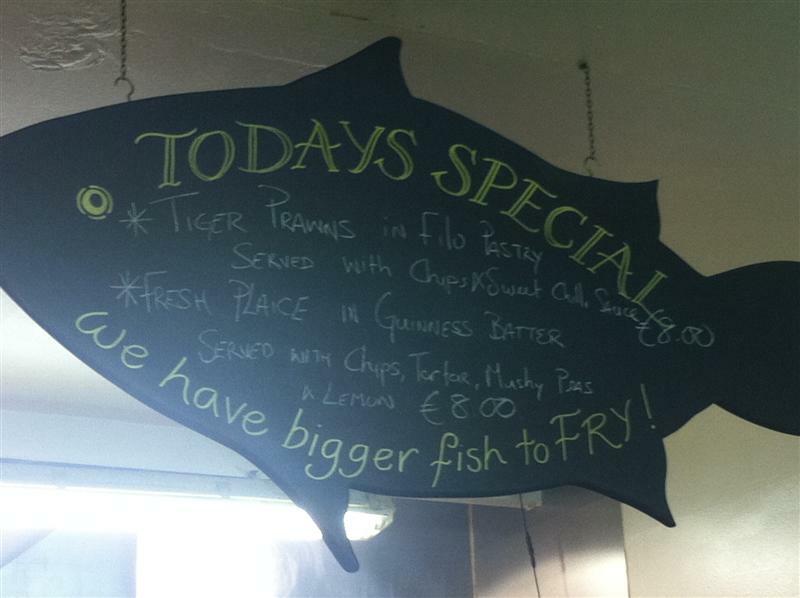 Alongside the old favourite of cod, you can find daily specials, which range from tiger prawns in filo pastry to fresh battered seabass. Even the packaging is novel. 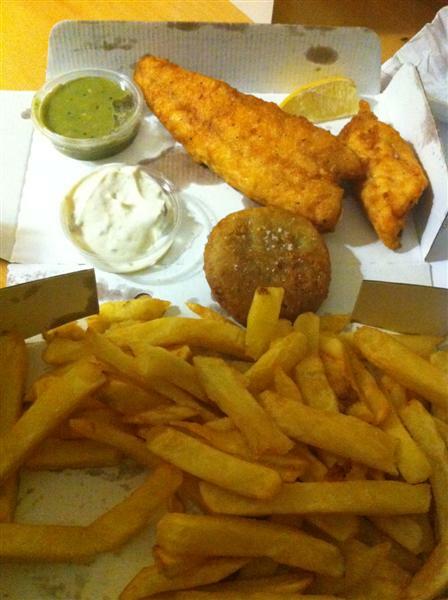 Instead of the traditional newspaper, the fish and chips come in a clever cardboard box, which makes a handy plate when opened out. Chip portions are more than generous and they even carry a personal favourite of mine, the mushy pea fritter. The Fish Wife also sells a range of burgers, which I've been told are good, although I've yet to try them myself. Every time I've eaten at the Fish Wife I've found the batter to be very light and crispy, and a recent piece of seabass showed how any piece of fish can be battered. In a city where chippers are taken very seriously, the Fish Wife is definitely one of the best. On a recent weekend trip to my hometown of Cork, we found ourselves looking for somewhere different to dine. There seemed to be one main contender, the Market Lane restaurant which had received several good recent print mentions along with Twitter recommendations. I attempted to make a booking for a Saturday night, but once I navigated the irritating automated answering service, I learned that they do not take bookings for smaller groups. In order to ensure that we got a table without any hassle, we arrived around 6.00pm, entering through thick red velvet curtains. Even at this early stage, the restaurant was very busy, but we were led upstairs and seated in one of the few remaining free tables. Placemats double up as menus and there were plenty of options from which to choose. In fact, I'd go so far as to say there was too much choice. I'd have preferred to see a smaller list of well-chosen options. Staff were emerging at machine gun pace from the kitchen bearing plates of food and our starters arrived quite quickly. 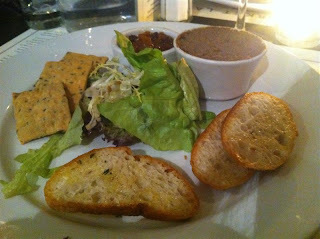 My generous portion of country pork liver and date pate with crackers, toast and chutney (€7.70) was reasonable, although somewhat grainy. The plate featured an unnecesary pile of sad looking wilted lettuce leaves which I left uneaten. I'd love to know how much money restaurants waste on plate garnishes that are returned to the kitchen. 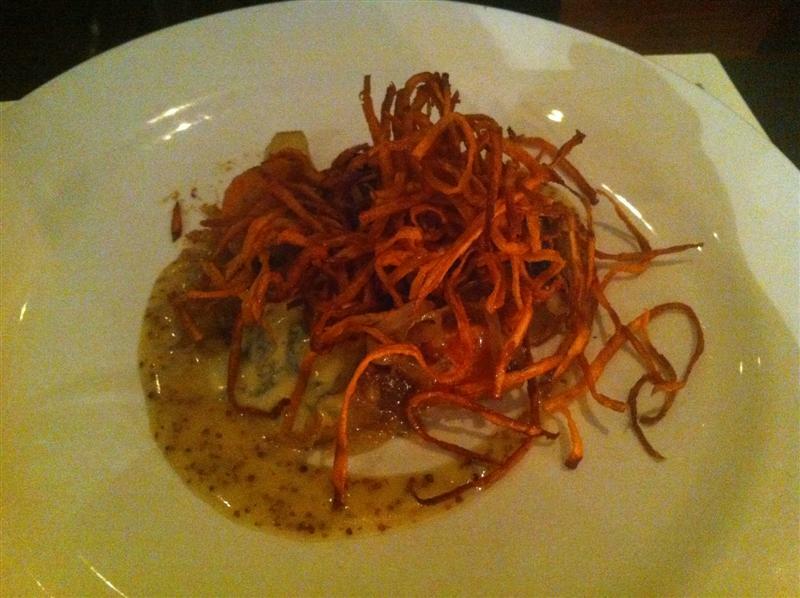 Himself received sweet potato with Crozier blue cheese, spinach, dates and roasted pine nut oil (€7.20). When ordering this dish, we had to ask what it actually was, as the menu only lists the ingredients. Was it perhaps a tart or maybe a salad? It turned out to be a melt of blue cheese, spinach and dates, topped with crispy sweet potato strings and the unusual combination of salty and sweet ingredients worked really well. When ordering, I had felt a craving for pasta. For your information, I generally don't order pasta in mixed-menu restaurants as it's usually overcooked, stodgy and coated in bad sauce. I should have followed my instinct in Market Lane. 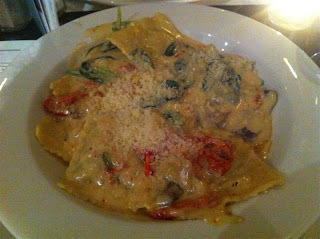 My main of spinach and ricotta ravioli with wild mushrooms, semi-sundried tomatoes, cream and parmesan (€13.95) was served compressed into brick-like solidity. The presence of meaty mushrooms and tangy tomatoes meant that the sauce was pretty good, but the stodgy ravioli just didn't do it for me. We had both been tempted by the Pork Wellington in flaky pastry with Jack McCarthy black pudding, fondant potato and carrot puree (€17.95) and it didn't disappoint. 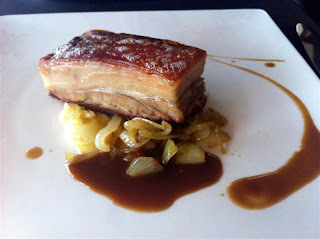 Lovely light flaky pastry with just-cooked pork and a lovely layer of spicy black pudding. This surely is a signature dish for Market Lane and I love the incorporation of McCarthy's excellent local pudding. A glass of Southern Light Sauvignon Blanc and a bottle of Paulaner beer bought the total bill to a very reasonable €58.80. Market Lane is clearly a popular venue with a high table turnover on the night we visited. 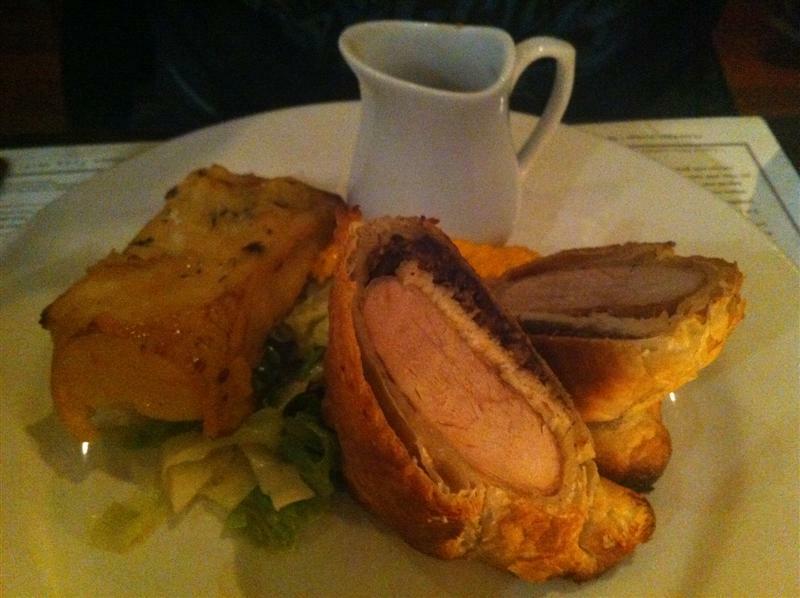 The pork Wellington was a particularly good dish, but I feel that Market Lane suffers from its popularity. There are too many choices on the menu, which gives a feeling that the restaurant is trying to be all things to all people. I'd much rather see a pared down menu, keeping the best dishes and losing the noise. I have a slight addiction to Masterchef. I watch it in all its variants, although I must admit that I'm not that partial to Masterchef Australia. Perhaps it's a bit too relaxed for me, which is probably the reason I adore the more high octance Bristish Professional version. In order to cook for Michel Roux Jr, the contestants must first pass the gauntlet ferociously guarded by sous-chef Monica Galetti. The withering looks from this woman are a joy to behold as the contestants inevitably fail to live up to her high standards. The standard is high, very high. Therefore, it was with interest I watched the Irish Masterchef series. Dylan McGrath (from Rustic Stone) shone as our home-grown culinary superstar chef, and eventually the lovely Mary Carney was crowned the first Irish Masterchef. Mary's cooking in the final was superb (and looks like it was partially inspired by her stint at the great Chapter One), but my lingering memory of the entire series was the line "A hake died for no reason today". This putdown on a contestant's cooking was was delivered by Anita Thoma, head chef at Il Primo. Her appearance on television reminded me that I had been passing by Il Primo for many years. The hand-written menu on the front window had often caught my attention, along with some tempting lunch time prices, but for some inexplicable reason I had never visited. One quick Twitter lunchtime booking and everything was put right. On arrival, we were warmly greeted and given two small flutes of prosecco to relax with while we read the menu and daily specials. 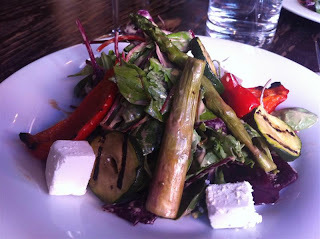 We both decided to go for salads for starters - veal salad for him while I had warm grilled vegetables with goat's cheese. In my case, asparagus, courgettes and sweet grilled peppers mixed wonderfully with the tangy goats' cheese and the emulsified balsamic dressing. His salad of cooked veal slices and richly coloured leaves was equally substantial and well-dressed. Crab & leek lasagne sounded so intriguing that I had to order it for my main course. 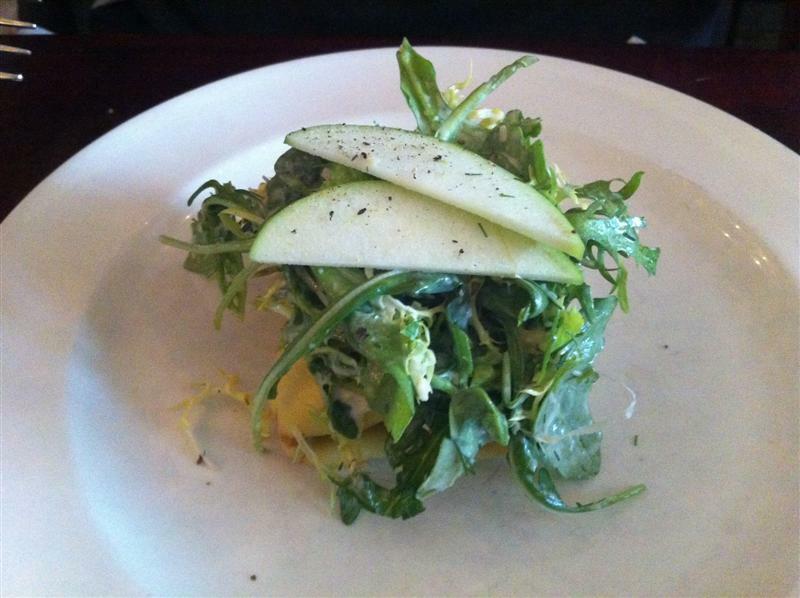 It featured dense layers of homemade lasagne sheets, sweet chunky flakes of crab meat and gently cooked leeks. A creamy tomato sauce bought it all together beautifully. Our server told us that it was one of the few dishes to constantly remain on the menu during the 20 years that Il Primo has been open, and it's easy to see why. 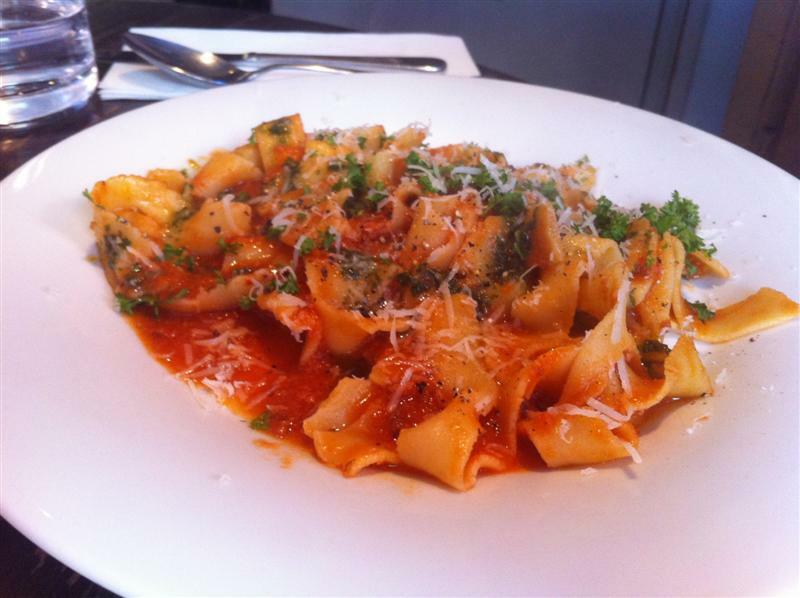 For himeself, ribbons of pappardelle with sausage was a winter warmer dish. The smoky meaty rich tomato sauce had beautifully coated the pappardelle, and a quick scattering of freshly grated parmesan was all that was required. 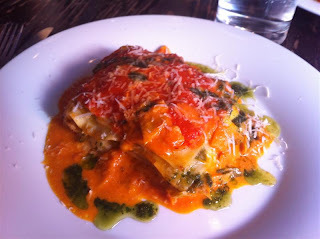 This really was rustic, hearty Italian cooking done simply and done well. The lunch menu offers 1 course for €13, 2 courses for €16 or best of all, 3 courses for €19. We might have stopped after two courses, but the daily menu featured chocolate cake with vanilla cream. The cake turned out to be moist and rich with a fudgy centre, but still have a light texture. A food contradiction! 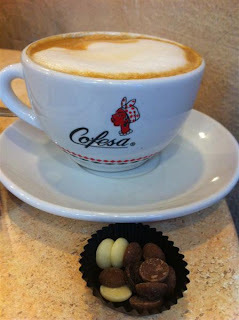 Two delicious espressos went fantastically well with the cake. My one regret about our lunchtime visit to Il Primo was that we hadn't visited earlier. The very generous portions meant that I spend the rest of the afternoon struggling not to fall asleep while a total of €38 represented great value for a lunch of this quality. Service was perfect throughout the meal, and the cosy nature of the interior means that it would also be perfect for a romantic and sophisticated evening meal. 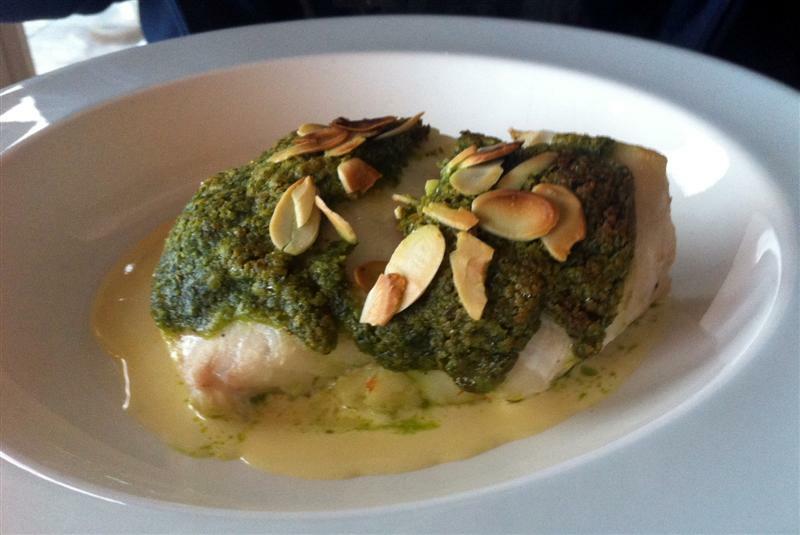 With four locations in Ireland, Indie Spice is a well-established group of restaurants. The first was founded in Belfast over 20 years ago and expanded with newer venues in Swords and Naas. 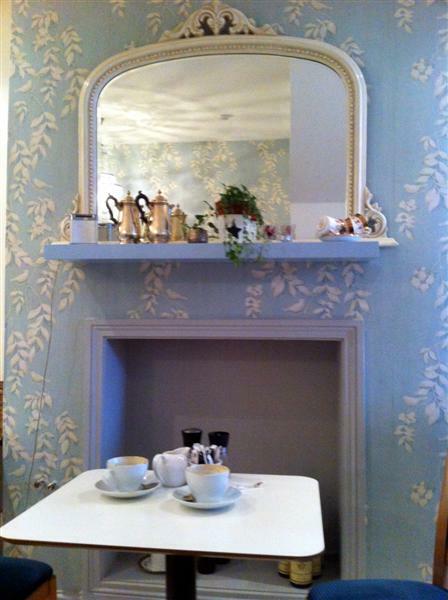 The latest addition to the chain is to be found in the genteel and sophisticated neighbourhood of Sandymount. Located upstairs, the interior is modern and extremely stylish. 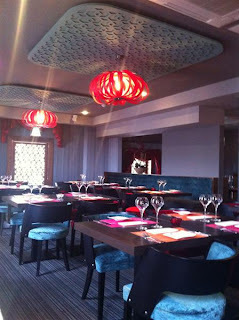 It's so nice to sit in a restaurant with vibrant colours and design. Red lattice lampshades and jewel tones are balanced nicely by dark furniture, while an open kitchen pass allows diners to view the chefs at work in the kitchen. Personally, I like this kind of decor as I find it a refreshing change from the curry-house interior that persists in many, older restaurants. The menu comes as a fancy, printed brochure, while paper place mats feature recipes to try at home. Traditional, well-known dishes mingle alongside some lesser known dishes, including one of my favourites, the achari pickle curry. 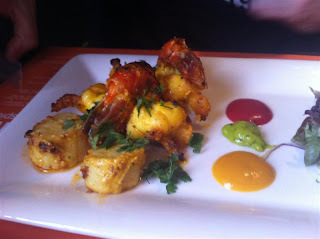 For starters, himself chose the fearsome sounding Piri Piri Prawns (€10.95) while I went for a favourite with the vegetarian Achari Paneer (€7.95). The prawns came with scallops and pretty dots of different coloured sauces, providing a very meaty starter but the promised 2 chili rating didn't really materialise. This was probably due to the fact that despite being large and plump, the seafood was rather bland and watery. My paneer starter featured the same set of polka dot sauces, but needed lemon juice (stolen from his starter) to really zing. 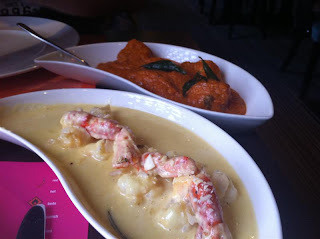 I was feeling in the mood for something mild, so I had chosen Malai Chingri (€21.95), which promised jumbo prawns cooked in coconut milk and sweet spices. It turned out to be deliciously sweet and creamy with plenty of chewy coconut flakes. Himself has a big love of seafood curries so he opted for Malabar monkfish curry (€23.95), which featured dense monkfish chunks in a rich sauce fragrant with fresh curry leaves. However, both dishes were let down by the quality of the seafood itself, which, like the earlier starter, was bland and watery. Like a lot of Indian restaurants, rice and sundries are extra, which is a bit much considering the price of the main courses. When a restaurant charges €20+ for a main, I don't think it's unreasonable to expect rice to be included. We added a light, fluffy garlic naan to our meal for €2.95. Our meal was settled with a Living Social voucher (2 starters, 2 mains and 2 glasses of wine for €39), which saved us over €35, based on printed menu prices. To be honest, I'd really have my doubts about paying full a la carte prices. 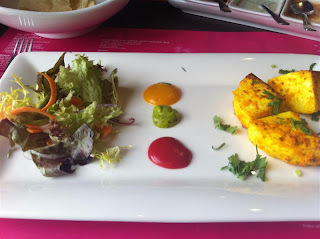 Although I did enjoy my meal, it wasn't a stand out Indian experience in the way that you can justifiably expect in venues such as Jaipur or Ananda. It's good, decent Indian food that shouldn't carry a big price tag. Thankfully, Indie Spice offer some great value set menus for lunch and dinner (which can be found on their website here) including a 2 course lunch for €8.95 and a 3 course Sunday lunch for €16.95. We are lucky to have a small stretch on the Upper Rathmines Road which is home to some fine food shops. Field & Vine is a superb little grocer, selling a great range of organic products as well as fresh fruit and vegetables. Lawlor's butcher provides high quality fresh meat and fish, as does Connolly's seafood, while Fothergills is a fine deli. Bizarrely, this little shopping enclave has been without a cafe or restaurant since the closure of Wild Lily's Cafe some years ago. The arrival of the very stylish 161 Cafe & Bistro has thankfully rectified this gap. A simple facade in gray and blue hints at the sleek interior, which is decorated in light blue, with whitewashed floors, white bench seating and plenty of scattered cushions. Since it opened earlier in the year, it has established itself as a popular family-friendly spot with the locals, who pack it out for brunch on weekend mornings. 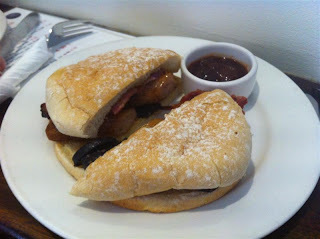 We visited recently for a fortifying Saturday brunch before heading to the Honest2Goodness market in Glasnevin. Just about all the tables were occupied, with families featuring strongly, but we were able to snag a small two person table. 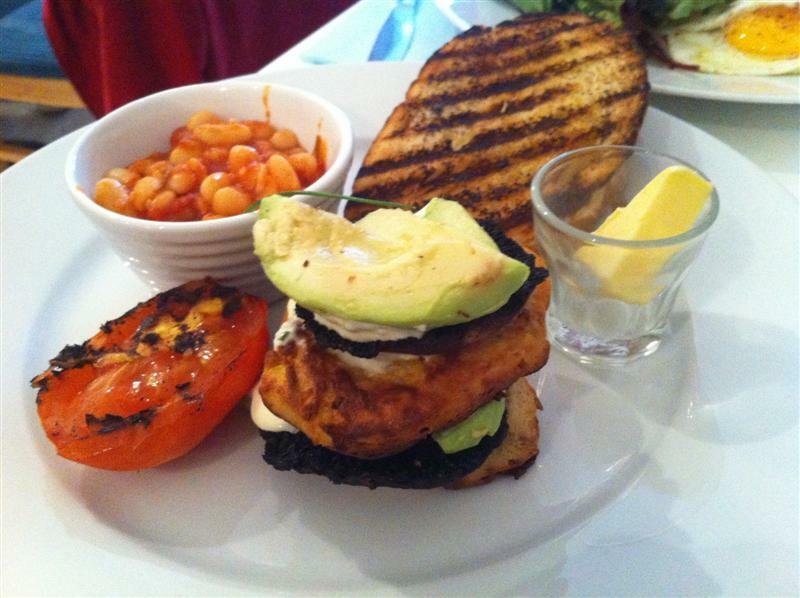 The Brunch menu lists all the usual dishes, but I was intrigued by the description of the 161 Vegetarian Brunch which contains corn fritter stacks with avocado & portobello mushroom, grilled tomato and baked beans (€9.50). I received a carefully constructed tower , while homemade baked beans came in a little rammekin dish with freshly toasted sourdough bread on the side. I found the beans to be sharp and even uncooked in places, but the corn fritters were excellent, and a great alternative to the traditional meaty breakfast. 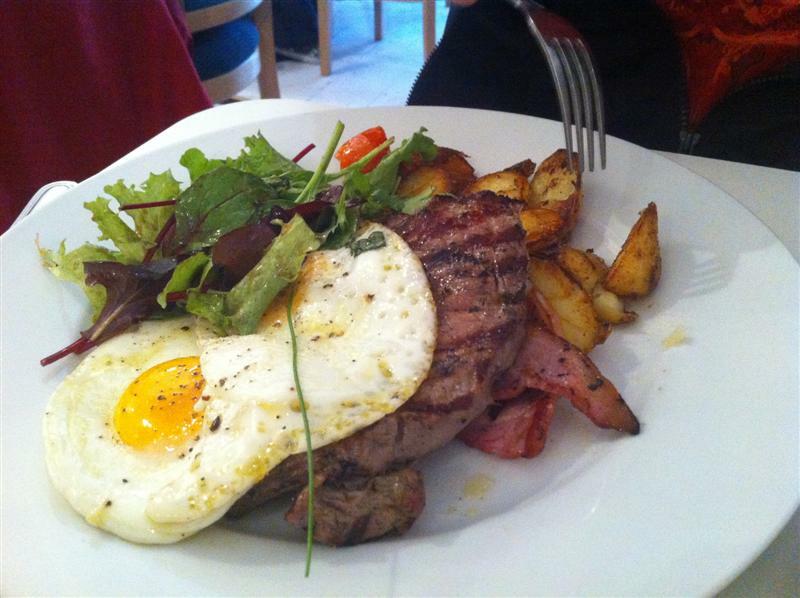 Himself went for Steak and Eggs, which features a 6oz sirloin steak with fried egg and sauteed potatoes (€10.00). Simple and straightforward, this dish delivered the required morning after sustenance with the sauteed potatoes being exceptionally tasty. We did experience a mix-up with our coffee order, but a smile and apology from the front of house helped make everything right. 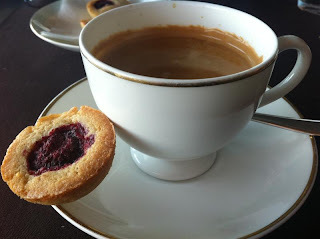 Regular americanos cost €2.20, rising to €2.50 for a large coffee. Fresh-squeezed orange juice, just baked pastries and scones and simple tasty lunch keeps the crowds coming during the day, while dinner is served until 10pm Thurs-Sat. 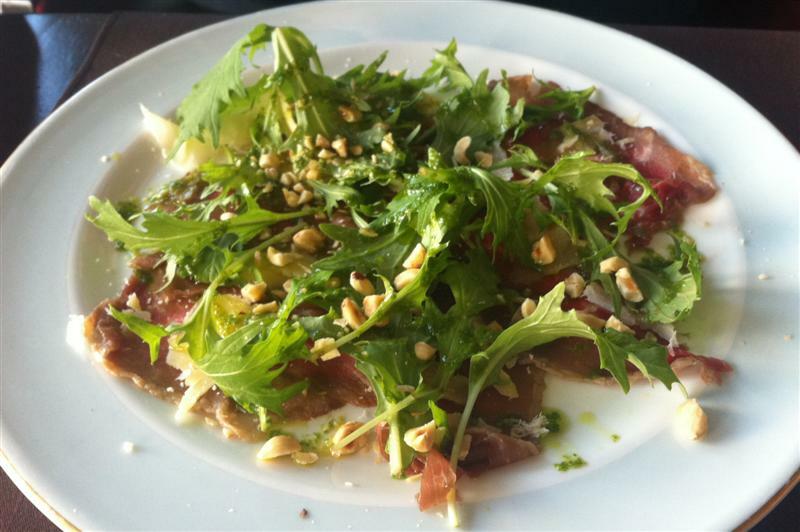 161 Cafe & Bistro is the kind of venue that every suburb or shopping area needs. Nothing overly fancy, but everything here is prepared to a high standard. Judging by the crowds I see in the window every weekend, lots of other people are enjoying it also.